CasterHQ's Blue Solid Polyurethane Wheels are Molded and Machined for high performance and longevity. Our Solid Polyurethane Wheels have no way of tread separation since they are one solid piece. These wheels are great for wet and corrosive environments. 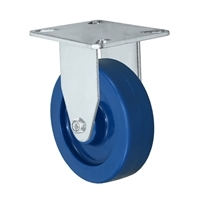 3" thru 5" Diameters - Up to 350 lbs Capacity - Plate Size: 3-1/8" x 4-1/8"
CasterHQ's Blue Solid Polyurethane Wheels are Molded and Machined for high performance and longevity. Our Solid Polyurethane Wheels have no way of tread separation since they are one solid piece. 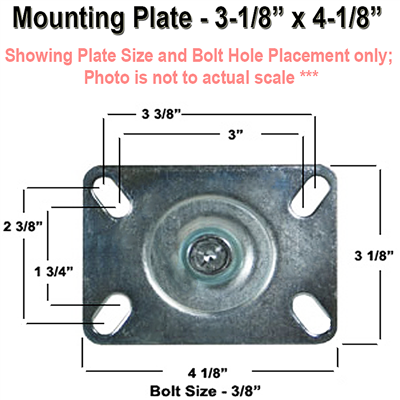 These wheels are great for wet and corrosive environments and will not mark the floor. Solid Polyurethane Wheels are made to resist most chemicals including Acids, Cleaning Chemicals, Bleach, Water, and other harsh or corrosive chemicals. These wheels are best used in clean room environments or wash-down applications. You can choose from a variety of Bearings including Delrin (Plastic) Bearing, Stainless Steel Precision Bearing (Rust Resistant), Precision Bearing, Roller Bearing, or a Stainless Roller Bearing. These wheels are good for temperatures from -40 ° Degrees Fahrenheit to 180° Degrees Fahrenheit . These wheels go by many names in the industry from Solid Urethane (SU Wheels), Solid Polyurethane (PLX Wheels), Solid Polyurethane (SPU Wheel),. If ordered before 12-noon all orders typically ship the SAME DAY!